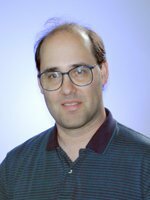 Congratulations to Dr. Greg Schenter of Pacific Northwest National Laboratory on being named Laboratory Fellow, the highest rank that PNNL research staff can attain. Schenter is internationally known for his fundamental research in the collective behavior of molecules and his seminal contributions to theoretical chemistry and the interpretation of experimental measurements. As a theorist, Schenter has uncovered mysteries surrounding molecules and atoms. For example, using sophisticated calculations and supercomputers, he developed accurate methods for calculating how small, light molecules and atoms such as helium and hydrogen would move and react in solids and in solution. These methods are critical for those building better batteries and alternative fuels. Another example is his theory of how droplets form or nucleate, improving previous theories and changing that way scientists see everything from cloud formation to fuel cells. He has worked closely with experimental scientists across the country, including researchers at Harvard, Stanford, EMSL, and Georgia Tech. His work delivers key insights into interpreting pioneering experimental techniques, including x-ray absorption fine-structure spectroscopy, diffusion in ice, and pyroelectricity. In addition, Schenter is well known as a mentor and collaborator. He has personally mentored PNNL staff for more than 20 years. Further, he organizes national symposiums for the American Chemical Society. An outstanding author, with nearly half of his publications in top 5 journals, he is among the most highly cited authors at PNNL.